Back from my Christmas break yesterday for the Feast of the Baptism of Christ. On this day we all go down to the font to recall our baptismal promises dedicate ourselves to the service of Christ. Here’s what I said. I remember clearly the day the Queen came to visit my home town, well over 40 years ago. I was still in primary school and for weeks ahead we were getting ready for the great visit. When the day itself finally arrived the whole school were marched two miles down the road and lined up along the roadside, our free Union Flags clutched firmly in our hands. There were people lining the road on both sides for as far as we could see. And we weren’t even in the road she was coming down. She came down the A6, and we were in a road off the A6, about 30 to 40 yards from the junction, so the chances of seeing anything were going to be pretty slim. We waited for what seemed like for ever – though I suspect it was probably only a couple of hours. And then she came. Or at least I have always assumed that she did. For all we saw was a brief flash of black as a limousine whisked past. The fleeting glimpse we got of the person in the back could have been anybody. These days, of course, the Royal Family are much more accessible and we are now used to them “going walkabout”. They are no longer the rather distant and awe-inspiring figures they once were. But I imagine we would still, get rather excited by an impending visit. Think how you’d feel if you read in one of our local newspapers that Caterham Valley was to be visited next Sunday by the Queen. She might be more accessible these days but we all know that everyone would make sure that she was given, to coin a phrase, a right royal welcome. How do you think she would expect to be received? She’d probably arrive in a Rolls-Royce, which would be part of a cavalcade of gleaming cars carrying other dignitaries. She would, no doubt, be escorted from the car onto a red carpet. There a row of carefully selected people would wait to bow and curtsey. You’d probably not expect to catch more than a glimpse of her through the bustling crowd. Now let’s imagine that you come into the Valley next Sunday. Then imagine how you would feel if you saw the Queen stepping off the bus! Or emerging from the station having braved one of our local trains – no direct trains on a Sunday, of course. You simply wouldn’t believe your eyes. Queens don’t behave like that. I know many of you go shopping in Waitrose after the morning service. Imagine your amazement if you were to find yourself standing behind the same Queen at the Waitrose checkout – I assume she’d use Waitrose rather than Morrison’s – and overheard her chatting about her visit to Caterham with the assistant as she bought her groceries! Later, on your way home, you notice her going into the Surrey Hounds to have a quiet pint in the corner with some of the locals. Well, it wouldn’t happen, of course. Kings and Queens don’t behave like that and we don’t expect them to. But it gives you an idea of the shock that faced John the Baptist. For he faced a similar surprise. He had dedicated his life to the calling God had placed upon him — to ‘prepare the way for the coming Lord’. He had had plenty of time to consider what this Messiah, this coming King, would be like and what his ministry would involve. He anticipated a mighty, powerful figure that would baptise not simply with water, like himself, but with the Holy Spirit and fire. John was at pains to point out to the crowds that flocked to him, that he was only the messenger getting them ready for this coming king, even saying that he wasn’t worthy enough to be his slave! With such expectations we can imagine John’s surprise when Jesus began his ministry. His very first act was to come to John amidst the crowds and ask to be baptised, just like everybody else! John would have been as shocked by this as we would be if the Queen were to arrive in Caterham Valley on the bus, go and do her shopping in Waitrose and finish up at the pub for a drink. 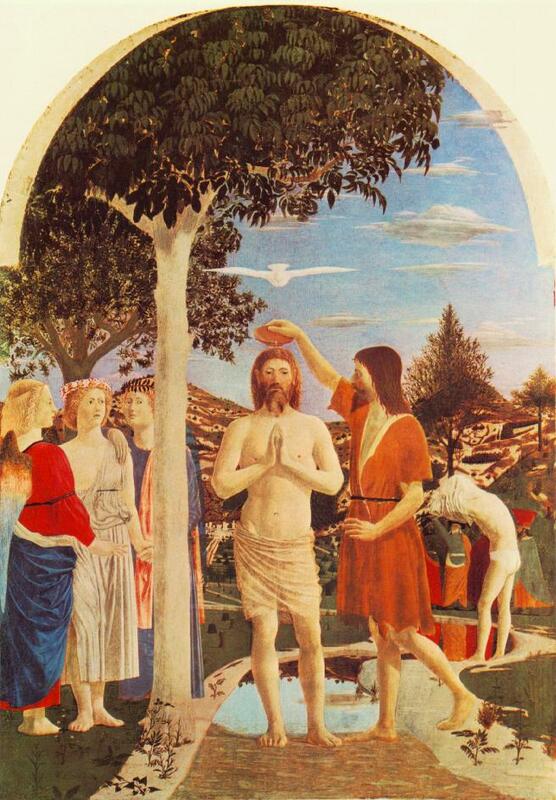 And so naturally John protests – he tries to prevent Jesus being baptised. His baptism symbolised repentance from sin; why on earth would the sinless Christ need to undergo such a ritual? The answer was that right from the very start of his ministry Jesus chose to walk the same path as us. Despite sharing God’s nature he chose not to stay at a distance from messed-up humanity but to identify himself with us, taking on our very nature, sharing our suffering and facing our pains and temptations. And it was through his choice to get totally involved in our sinful world and take upon himself our wrongdoings that his power would be made manifest. By bearing all of our sins on the cross, he conquered the forces of sin and death, making our forgiveness possible, and by his Holy Spirit he empowers us to lead new victorious lives. Jesus certainly did not carry out his ministry in the way people expected but in obedience to God, and God’s ways are higher than ours! Jesus chose from the very beginning of his ministry to walk alongside us – his decision to receive John’s baptism for the repentance of sin shows us this, even though he himself was sinless. He calls us to make a response to his ministry – a response we make when we are baptised, or when if we were baptised as a baby we make the decision to live according to our baptism vows and are confirmed. And so today, on this feast of the Baptism of Jesus, we recall our own baptism, we reflect upon the progress we have made on our journey with our King through this world. And we gather around the font as we renew our commitment to him, determining that as we face a new year we will walk alongside the King who chose to come and walk alongside us. And to symbolise that commitment we are invited to make the sign of the cross with water from the font, as we recall our own baptismal promises. For the Jesus that whilst on earth chose to identify himself with humanity, is still in heaven waiting to hear our cries and to intercede for us, intimately understanding our own pain and suffering from his own experience. He also comes alongside us by his Holy Spirit bringing strength and comfort. We will not always understand why he does things the way he does, just as John the Baptist didn’t, and he will often surprise us, but we can be sure that he truly is Immanuel, ‘God with us’. And so we go, now, down to the font. As we recall the baptism of Jesus, and as we recall our own baptism, we rededicate our lives to him. We recommit ourselves to walking alongside the God who came to walk alongside us.